After lunch, commence an excursion to the ruins of the rock fortress complex of Yapahuwa. 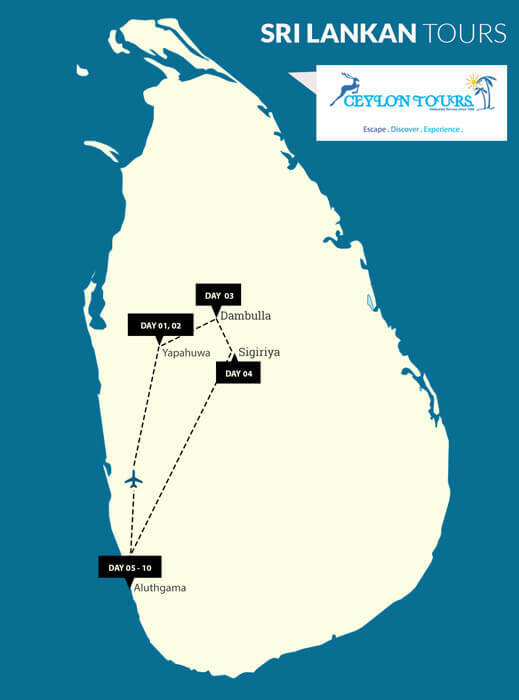 It served as the capital of Sri Lanka in the latter part of the 13th century (1273–1284). Built on a huge, 90 meter high rock boulder in the style of the Sigiriya rock fortress, Yapahuwa was a palace and military stronghold against foreign invaders. Overnight Stay : Hotel Kuren Maho in Yapahuwa. After breakfast, enjoy a full-body Ayurveda Treatment at the hotel. Before Ayurvedic treatment begins, a traditional pulse diagnosis is conducted to establish your constitution type. The interaction of the Ayurvedic treatments, Ayurvedic medication and Ayurvedic diet leads to healing, purification and detoxification of the body. Harmful substances in the body are isolated and released using natural processes. All three meals consist of Ayurvedic diets and drinks. After breakfast head for Dambulla and explore the famous Golden Rock cave temple which has been declared a UNESCO World Heritage Site. Beign a sacred pilgrimage site for 22 centuries, this cave monastery, a vast isolated rock mass with its five caverns is the largest best preserved cave-temple complex in Sri Lanka. Afterwards leave for Hiriwadunna trek, consisting of a bullock cart ride, boat ride as well as a small nature trail, on this you can see and learn to cook. On completion leave to Polonnaruwa one of the ruins of ancient Ceylon - the UNESCO World Heritage City of Polonnaruwa, which was the Capital of Sri Lanka from the 11th to 13th century. A well-planned medieval city defended by enclosing walls (around 5 km. which still remain), graced by palaces, shrines, monasteries, pavilions, parks, ponds and irrigation lakes. Polonnaruwa is strewn with ruins in a resplendent state of preservation. The 'Gal Vihara' which consists of statues of the recumbent, standing and seated Buddha have been cut from a single granite wall and rank among the true masterpieces of Sri Lankan Art. Overnight Stay : Hotel in Polonnaruwa. After breakfast leave for Sigiriya. Begin the morning by climbing the rock fortress of Sigiriya - a 5th Century "Fortress in the Sky". Built by King Kassapa, which was a Royal Citadel for more than 18 years. The lion rock (A UNESCO WORLD HERITAGE SITE) is a citadel of unusual beauty, rising 200 metres from the scrub jungle. The base of the rock is ringed by a moat and rampart and extensive gardens including the renowned water gardens. The majestic Lion’s Paw picturesquely guards the stairway of the palace on the summit. See the famous frescoes of the "Heavenly maidens" of Sigiriya in a sheltered pocket of the rock and the 10 foot high Mirror Wall. Continue to Kandy. The bustling hill country capital which is now a UNESCO World Heritage Site, is famous for the pink painted Temple of the Tooth, which houses the most sacred religious relic - the tooth of the Lord Buddha. The Kandy Lake built in 1807 is the attractive centerpiece to the town, among many other sites. Head to your hotel in Aluthgama on completion. Lanka Princess Hotel is renowned for personalized Ayurvedic treatments, meditation, yoga and leisure facilities focused on the rejuvenation of the body and mind to cater to the modern traveller seeking relaxation. On arrival at the Ayurveda Health Centre, guests are introduced to this ancient healing concept with information about the courses of treatments available and the type of Ayurvedic diet, which may be prescribed. Once the initial medical consultation has been completed, the team of experienced Ayurveda doctors will be at your disposal any time, should you wish to discuss your course of treatment or ask any questions pertaining to your state of health. In the final medical consultation, guests will be provided with written recommendations on diet and nutrition in order to enable them to maintain the positive results of their treatments over a long period of time. This will prove beneficial to clients suffering from skin conditions such as acne, dermatitis or psoriasis. At the beginning and at the end of the cure you will be examined by the staff doctor and your individual plan set up. «Wellness Pure» is ideal for those who would like to relax, relieve stress and gain more vitality. Meals – three times a day plus nonalcoholic beverages. Continue your «wellness Pure» program at the hotel. The hotel is situated on a lovely sandy beach. In between daily procedures you may enjoy the beach as well.